Summer is underway! I’ve finally packed away my winter sweaters, swapped my boots for flats and have been enjoying some time in the sun. In my past life as a shopaholic, the beginning of the summer season meant I got to spend many an afternoon shopping for the perfect floral dress, blister-inducing sandals, and a cute clutch to complete the outfit. Those days are long behind me. Now, I love shopping in my own closet. Even with the limited wardrobe that I have, there’s always a new way to combine pieces into something “new.” But, let’s be honest, I’m a very skilled (and shameless) outfit repeater. So, since I’m halfway through my 365-day shopping ban, I thought I would share some summer pieces from my closet that I’ve been loving lately. Disclaimer: you’ve seen some of these pieces before — in my workwear capsule wardrobe, my carry-on wardrobe for my trip to St. Lucia, and my week-long conference wardrobe. I wasn’t lying when I said I was a shameless outfit repeater. Another disclaimer: this isn’t a strict workwear or leisure wardrobe. It’s a little bit of both. I purchased this dress from MEC a couple of years ago now and it’s been my go-to leisure dress since then. It’s made of modal and organic cotton so it feels lovely on a hot summer day. Ok. This is basic, I know. But I love this t-shirt (also from MEC). It’s made of organic cotton and a teeny bit of spandex, so it’s equally comfortable for work as it is for an eight-kilometer hike through the Sleeping Giant. You’ve seen these pants before — I took them on vacation! If I could wear them to work, I would. I’ve worn them to the Farmer’s Market, out to dinner with family, grocery shopping and I’ve even done yoga in them. Pretty much anything that isn’t work. They’re from a Canadian company called Thai Pants Movement and if I wasn’t a minimalist, I’d probably own 20 pairs of them. They are the best. The end. I’ve been reaching for this well-loved Michael Kors dress since I packed away my wool pencil skirts. It’s one of my more recent Etsy finds from this store. It might be my favorite dress ever for one reason — it has pockets. Glorious, glorious pockets that come in super handy for my day job. Plus, it’s a loose shift dress, which means I can wear it without feeling body conscious. Yes, I am aware that I am a hippie. I can’t help it. Like my Thai Pants, I have yet to find a leisure outfit that this sweater doesn’t go with. The crochet makes it a perfect layer for summer days when it still gets a tad chilly in the evenings. Plus, this is the oldest piece on my summer wardrobe list — I’ve owned it for almost 8 years. That’s what I call a good return on investment. While I wouldn’t wear them to work, these rayon Lululemon shorts are perfect for hanging out on particularly hot days. They also happen to be the only pair of shorts I own that fit and are appropriate for public consumption (the rest are workout shorts). This t-shirt made an appearance in my workwear capsule wardrobe — and for good reason! I love the color, and the material is a soft and stretchy cotton-spandex blend. It’s a great shirt for when I want to look a little more dressed up but am too lazy to actually do that (which is often). The only problem is, I purchased it before Sears when out of business last year. So, if it ever gets damaged beyond repair, my hunt for the perfect t-shirt will have to start again! These jeans are from Second Denim (aka Yoga Jeans). They are made in Montreal, and, as the name suggests, are stretchy enough to do yoga in them. Let’s just say, I’ve put that to the test myself. Unlike normal “jeggings” (are those still a thing? ), they have back pockets, a normal waistband with belt loops, and a zip front. I love the 3/4 length when it’s hot out and putting my on full-length skinny jeans seems like the worst idea in the world. Another blue dress? I know, apparently, I have a thing for blues this year. This dress is from a Canadian company, Fig. Their products are made in Canada and this dress, in particular, was made from organic cotton. It’s been my other go-to work dress now that the temperature is rising. It’s a very classic color in a classic silhouette. If I ever ruin it in the wash, I might cry. These knock-off Birks have last me a number of years, and I hope I have at least a few more left in them! These, plus my Thai Pants and crochet sweater and I’m ready to relax! These also came on my trip to St. Lucia! You may remember that I scored from second-hand for $7 — quite the find, in my opinion. I’ve been wearing them to work when my feet want a break from my full(er) coverage flats. If I had the option, I’d love to add a solid, pre-loved pair of denim shorts to my summer wardrobe. I haven’t owned a pair that fit properly for a number of years now, and I feel they would really round out my other summer pieces. They’d be the casual opposite of my dressy navy blue shorts — a capsule wardrobe is all about balance! But, I know I can live without them for the foreseeable future. 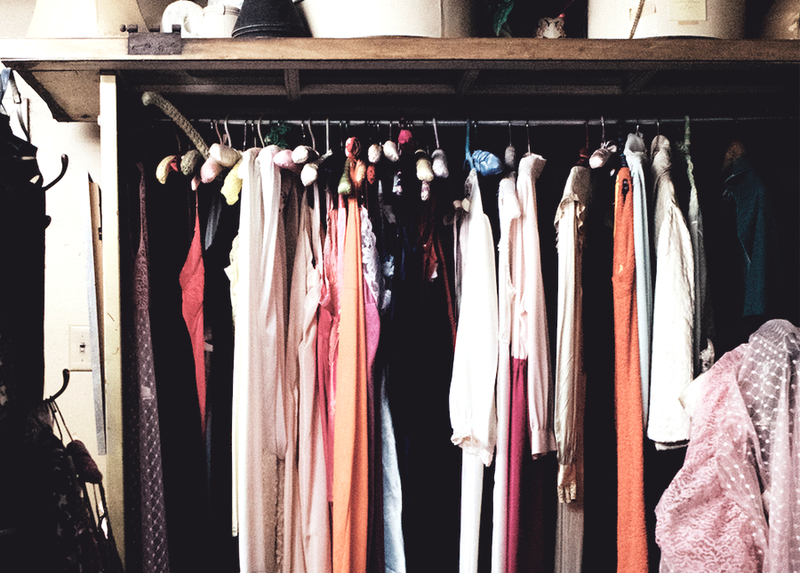 I have more than enough in my closet to keep my summer wardrobe interesting!